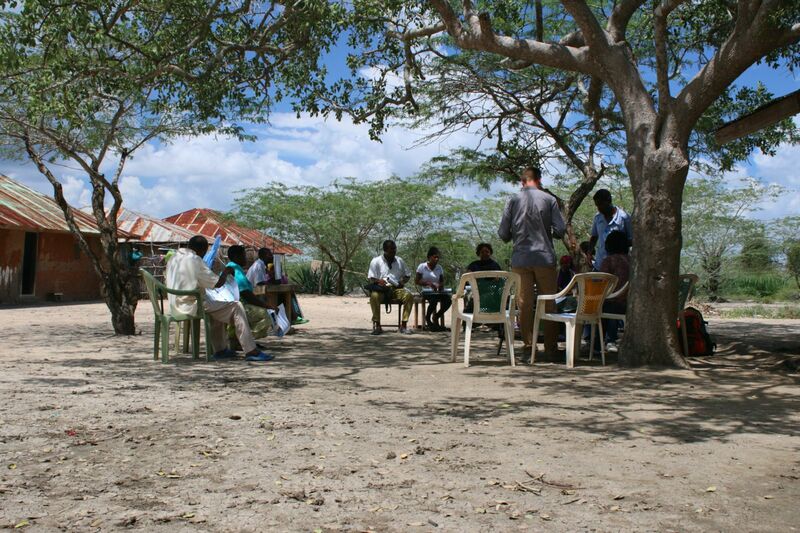 Over the past two weeks a Sentinel Project team has been in Kenya’s Tana Delta conducting focus groups in the various villages in which our Una Hakika initiative has been implemented. The free information service seeks to counteract malicious misinformation which has been the trigger for recent outbreaks of violence in the region. The discussion groups consisted of Una Hakika ambassadors, subscribers to the service and those who haven’t yet subscribed. The questions focused on the local understanding of Una Hakika, its impact, weaknesses, strengths and ways to improve. The responses were at times expected, surprising and always immensely helpful in improving how Una Hakika serves the residents of the Tana Delta. Overall the most consistent comments expressed a good understanding of the program, citing the name as being simple, easy to remember and clear about its purpose. Before Una Hakika, information was received via various means (i.e. – radio, television, word of mouth, administrative officials, religious leaders and mobile phones). However this information was received on average 3 days after an event had occurred and knowing whether it was true or false was difficult to impossible in many cases. To verify the accuracy of the information residents often had to ask those living in that area, the administrative officials and at times simply rely on rumours in the absence of any other information. One respondent said “false information travels faster than true information”, leading to the truth being realized only after the damage had been done. Rumors were therefore used maliciously and mundane misinformation had the potential to bring about inter-communal fighting. This brought about fear and tension in the area which was palpable when the Sentinel Project launched the project in October 2013. With the implementation of Una Hakika many respondents have noted a significant improvement, indicating that tensions have been reduced, the population is more informed, they have more ability to interact, and verified information is received in a timely manner. There have even been several instances in which Una Hakika was the first to receive reports of violence even before local authorities and security forces did. In line with this we also sought out opinions on what the initiative is doing well. Common answers were that Una Hakika has quick, accurate information in the area leading to reduced tensions. Previously, residents would quickly act on rumours but now they wait for and seek out accurate information before acting. This was encouraging news for Una Hakika as one of our goals was being achieved. Another common point was that community-led nature of Una Hakika has empowered the residents by providing information, access and direct input. We are optimistic that the education on information verification has already made a permanent mark on the local communities. As such, interaction between communities is improving as a result of the Una Hakika verification process and other local peace initiatives. Another related output was that marginalized communities were also incorporated in Una Hakika. This is the result of the design for Una Hakika which started with the goal of ensuring an all inclusive program with a very low or non-existent barrier to entry. One interesting comment from the village of Kibusu stated “[Una Hakika] gives us hope because the messages shows us what action has been taken concerning some rumours”, indicating that the counter messaging and quick feedback filled an essential need which was not being met by existing measures. Una Hakika ensures that counter messaging is quick, from trusted sources, in context, and sometimes with action to be taken by both rumour reporter and relevant authorities leading to an effective response. Most people claimed to join Una Hakika so that they can get accurate and trustworthy information. Those who did not join or had not yet joined emphasized that they did not understand exactly what the program entailed. This indicates a need for renewed efforts to spread the word about Una Hakika and its goals. Though we have carried out small barazas (village meetings), distributed posters, trained community ambassadors and can boast of approximately 1 in every 50 adult mobile phone users in Tana River County being a subscriber to Una Hakika, we can always improve. The methods that the participants suggested to encourage others to join and increase use of the system focused on awareness through barazas, sports, cultural events and economic activities that would bring people together. Another aspect noted was to improve communication by having more field visits and means to obtain evidence of events that take place; hopefully the use of drones – which have been field tested during this two week period – and equipping selected ambassadors with higher quality phone cameras can assist on this front. One key idea that was noted across all areas was having a financial or economic aspect during the awareness campaign as this would attract more people to use the system. This can be understood in the context of Tana River County being one of the poorest regions in Kenya; the Tana Delta conflict has scared off potential investors as well as NGOs leaving minimal developments taking place in the area. Since The Sentinel Project is one of the few NGOs in the Tana Delta it makes us consider what corporate social responsibilities (CSR) Una Hakika has as it expands. The best option would be for NGOs that operate in the region to collaborate on projects which can benefit the Tana Delta residents. Una Hakika will likely incorporate relevant economic and social events into its programming as addressing misinformation is but one part of a complex issue. This subject has been a great challenge for us as residents expect Una Hakika to fund and offer economic benefits which are outside our objectives and mandate. Those who had not yet joined responded positively to the idea that Una Hakika’s ability to provide accurate information would have a significant impact. One student said that by joining he could share information gathered by Una Hakika with other students and with those who are like minded. As the youth and children of the Tana Delta witnessed the violence, hatred and animosity during the clashes they are key to the future of Tana Delta. If they are not given the opportunity to make meaningful change within their community then the future of the region will be bleak. Una Hakika has made a notable and potentially long lasting difference in the region by reducing tension through the transformation of how information is used, transmitted and received. Nonetheless, more awareness of Una Hakika is needed in order to help a greater number of people understand what Una Hakika does. One thing was clear across all villages and respondents; they want Una Hakika to be extended, expanded and available to many more people. Respondents astutely point out that conflicts in the Tana Delta can often trace their origins to other parts of the coast region and sometimes further. We take this to be a strong vote of confidence for Una Hakika and a mandate to continue our work with the residents of the Tana Delta.